This treat is so quick to make (preparation is less than five minutes and cooking time about twelve minutes), it is definitely one of my quickest salty snacks/meals yet. It also hits a nice little sugar spot as well as you can’t really taste the salt! You can use absolutely any nuts you want. 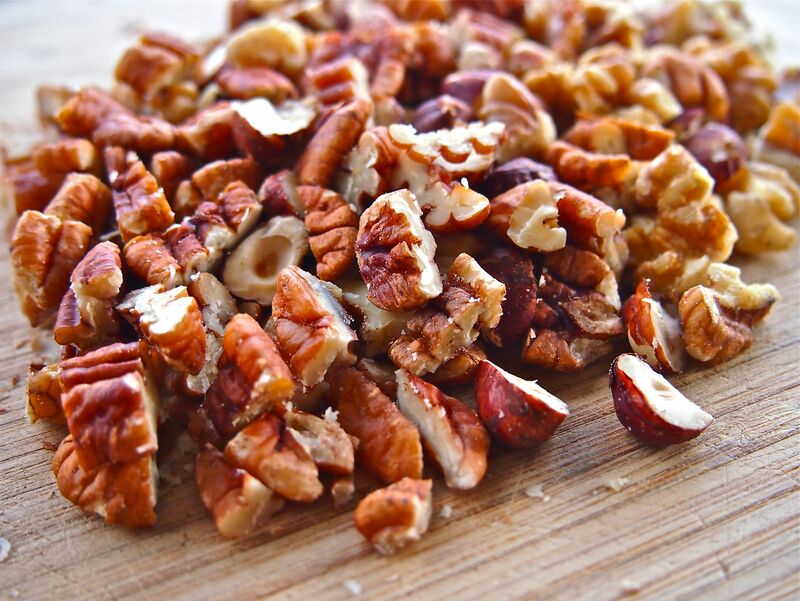 I used walnuts, pecans and hazelnuts because I had them around but this recipe would taste fantastic with any combination of nuts. Step 1: Preheat your oven to 180°C / 350°F and lay out approx. eight cupcake patties or a silicone muffin pan. *Note don’t use paper cupcake patties as it will stick to the bottom (trust me on this one). Step 2: Once you have figured out the combination of nuts you want to use and measured them out chop them up or blitz them in a food processor and pour into a small bowl. 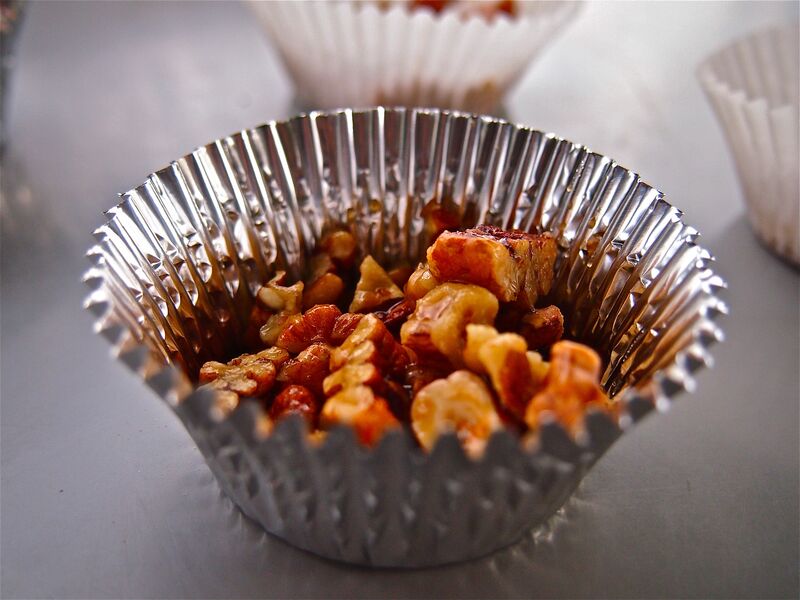 Step 3: Add the maple syrup (3-4 tablespoons depending on how sweet you want it), vanilla extract (3/4 teaspoon) and salt (3/4 teaspoon) into the chopped nut mixture and thoroughly mix through so the nuts are completely coated. Step 4: With a teaspoon, spoon the mixture out into the cupcake patties. *Note try to make sure all the cupcake patties have the same amount of mixture so they cook evenly. Pat down the mixture. Step 5: If you have just used cupcake patties place them on a tray, and place the tray into the oven, if you are using a muffin tin, place that in the oven for between 9 – 12 minutes. Remember to check on them. Step 6: Optional* When you take the clusters out of the oven sprinkle a few salt flakes on each cluster before they start to cool. *Note if you wait the salt will not stick to the clusters. Step 7: Once the clusters have completely cooled take the clusters out of the muffin tin/cupcake patties. Step 8: Eat and enjoy – fair warning though they are a bit addictive and because they are bite sized you don’t realise that you have finished eating one until you have! Step 2: Measure out a cup of nuts. Step 2: Chop the nuts up. Step 4: Pat down the mixture into each cupcake patty. Step 7/8: Take out of the cupcake patties and enjoy! Not cooling down fast enough? Stick the clusters on a plate and place in the fridge – this will speed the process up. Keep the clusters in an airtight container. 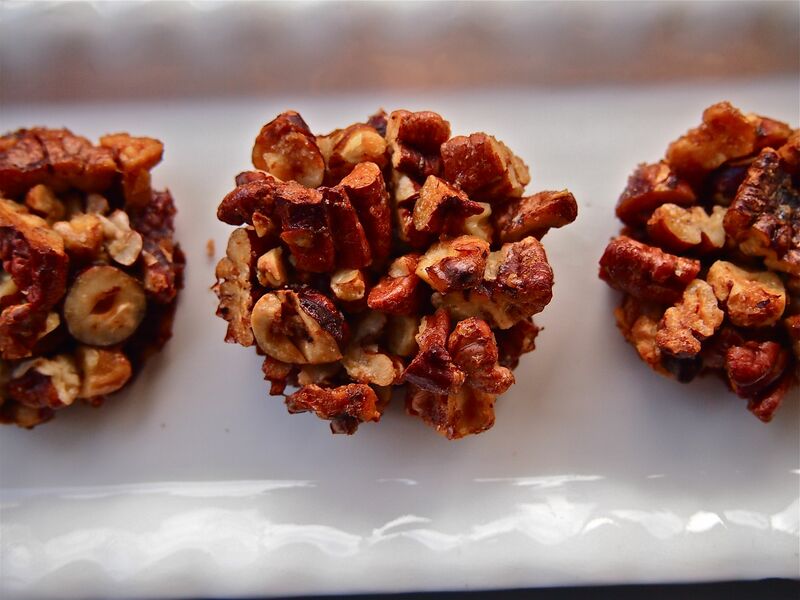 If you keep it sitting on the kitchen bench in plain sight they won’t last long as every time you walk into the kitchen you will want to munch on them – well I did. They should stay crunchy for a few days, and then will become a bit chewy. But it doesn’t look like it will cluster/harden in the oven! I know I was worried too when I put the cluster mixture into the cupcake patties because it just looks like wet nuts and it doesn’t look like it will harden at all in the oven but I trusted my gut and it all worked out. I mean, what is the worst thing that will happen? You’ll end up with nice coated nut mixture if I have led you astray (but I haven’t!). Haha trust me! Don’t use paper cupcake patties. I did and I couldn’t peel off the clusters from the bottom of the patties easily – I had to very slowly and painstakingly – not worth it. I used foil ones and they worked out fine. Silicone ones also work great. Learn from my mistakes! I am a big fan of this recipe. I just made it as a welcome home treat and it has gone over well – big bonus points for me. I love that it looks and tastes like a lot more effort has gone into it then it actually has. It is very easy to make and very easy to clean up afterwards. Let me know how you go with this recipe! P.S This recipe has been slightly altered by me but is the brains of blogger ItDoesn’tTasteLikeChicken and the original recipe can be found here. Thank you Raspberry it tastes amazing as well! Definitely trying this! 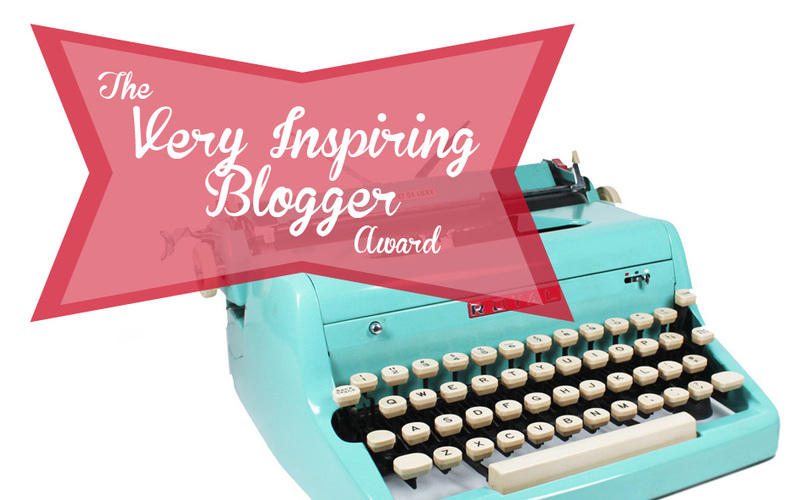 I am pinning this to my cooking board on Pinterest! Great idea 🙂 I need to do that more often with recipes so I don’t lose great ones when I find them. 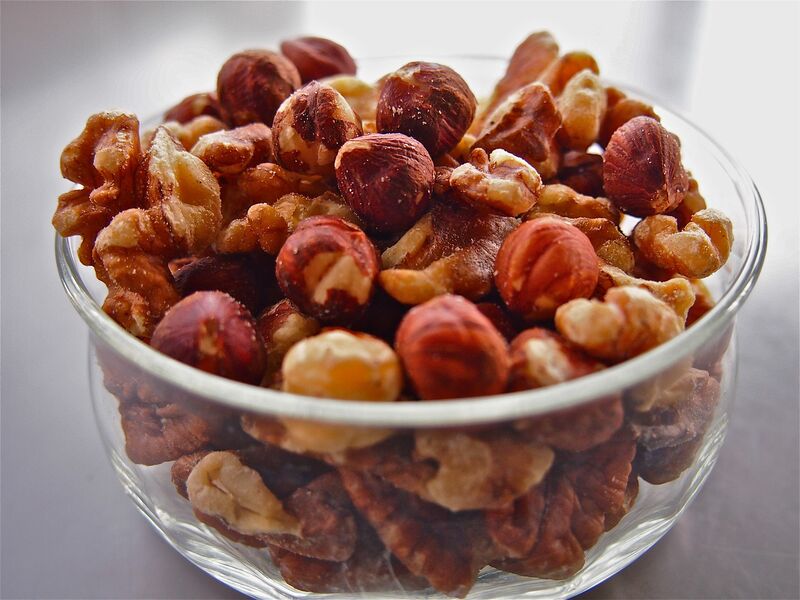 I hope you enjoy the Maple Nut Clusters when you cook them! Thank you Natascha’s Palace! 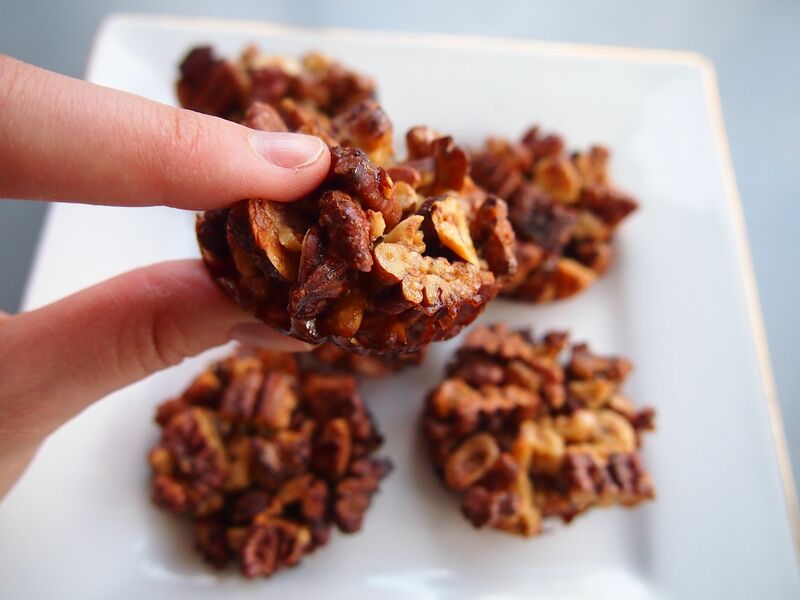 I’m already feeling a lot better and have been making a lot of these Maple Nut Clusters – the sweetness is definitely helping :). I’m so sorry you haven’t been well. But am glad you are feeling better! This sounds wonderful! Have a great week and welcome back! Thank you Robin :). It feels good to be back. These taste wonderful I hope you give them a try and enjoy them as much as I do! Thanks Freda they taste really great as well :). These looks delicious and some great tips! Thanks Lemonpath – I always hope that my mistakes or ‘learning experiences’ can come in handy for other people :). I hope you give these a try as they are so tasty!